The rumors are coming in fast and furious. Tim Brown reports that Grady Little has handed in his resignation. Grady Little has resigned as manager of the Los Angeles Dodgers, according to sources, ending a turbulent month between him and the club, and broadening the possibility that the Dodgers will hire Joe Torre as his replacement. A season-ending disagreement between Little and general manager Ned Colletti resulted in three weeks of uneasy silence between the two, that distance spurring the club's recent attempts to replace Little last week with Joe Girardi and this week with Torre, according to baseball sources. I wonder if Colletti has been getting some heat for the Dodger meltdown this year. If so, can we lay all the blame on just Grady? Hasn't some of Colletti's decisions been considered suspect? A flurry of rumors has been swirling around the country that seemed unbelievable at first. Torre to the Dodgers? No way. It sounded like a New York Post daydream. Some news guy was sitting at his desk wondering, "what can I make up today?" "Can I sell more papers by printing the most outrageous story out there." Come on now. 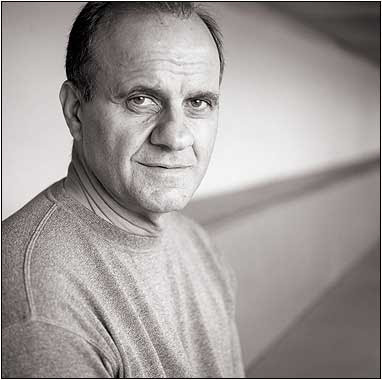 Joe Torre to the Dodgers? Sure, he has a track record that includes a multitude of World Championships. He has proved he can captain a ship while navigating the rough oceans known as the Sea of Steinbrenner. His players trust and respect him. But should he be a Dodger? I don't know. 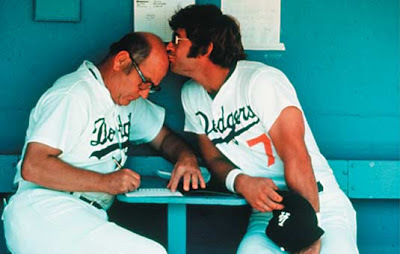 A part of me yearns for yesteryear, when our coaches came from within the system- born and breed Dodger blue. They led our teams for years; heck decades. Stability was the most important facet of Dodger baseball. We knew that Alston and then Lasorda would always be there. 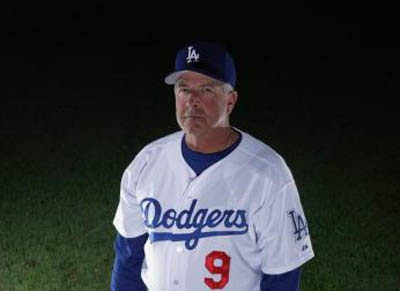 We also knew that one of our stars from the heralded Dodgers of the 70's and 80's would eventually take over the reins. Whether it was Russell, Lopes, Scioscia, Yeager, Baker, or whoever. We knew the tradition would survive. Unfortunately, tradition has been broken. Mike Scioscia left disgruntled, having been passed over, and found a home behind the orange curtain. Russell did not pan out as well as we could have hoped. Lopes and Baker have managed numerous teams, but have yet to come home to Los Angeles. Steve Yeager, our last connection to our past, remains in the minor league circuit waiting his turn. Am I saying I wouldn't welcome Torre if he headed west towards our shores. Of course not. I think he could do as good a job as our current skipper Grady Little. I just hope this doesn't cause a wrinkle that can force my favorite candidate as future manager of the Dodgers to go elsewhere. Every month or so I get a email from Old Cardboard featuring interesting hobby news, events, etc. 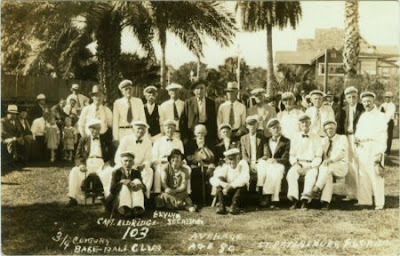 This past weeks email featured an interesting real photo postcard (RPPC) of the Three Quarter Century Baseball Club. Check the story link here. We recently ran across an interesting 1930s real photo post card (RPPC) that pictures a group from St. Petersburg, Florida. The subjects in the group photo are all members of the "Three-Quarter-Century Baseball Club." The postcard is well labeled and indicates that the average age of it's members is 80 years young! Old Cardboard subscriber and baseball postcard collector Dan Yaw, who lived in St. Petersburg for a number of years, tells us that the team was formed in 1930 and continues even today. According to Yaw, the postcard (shown above) can be readily dated to 1934. That's the year that Capt. Eldridge, labeled on the postcard as "103," celebrated his 103 birthday. Babe Ruth himself is known to have umpired at least one of the team's games while Ruth was training with the Yankees in St. Petersburg. Lou Gehrig and Connie Mack were also active supporters of the club. The "quarter century" club name recently took on a second meaning. In addition to restricting it's members to being three-quarters of a century old or older, the club itself reached the three-quarter century mark in 2005. The group is now playing in it's seventy-eighth year. The club is perhaps better known today as the "Kids and Kubs" league, still in St. Petersburg. The league is now organized into four teams. Every Tuesday, Thursday, and Saturday during their regular season, the four teams face off in a double header. Two teams face off at 10:30 am and the remaining teams play at 12:00 pm. In the league's heyday, games were attended by as many as three to four thousand supporters. Today, however, the games are much more modestly attended and played mostly for the enjoyment of the players. The Kids & Kubs dedication to their league is not born out of competition but for the love of the game. If one team wins too often, they trade players around to "even things out." The Kids & Kubs play all regular season games at the North Shore Park located on Tampa Bay at the foot of 8th Ave. NE. Anyone interested in joining Kids & Kubs (only if you qualify) should call 727-893-7108 to arrange for a try-out. Be forewarned, however; the competition is keen.